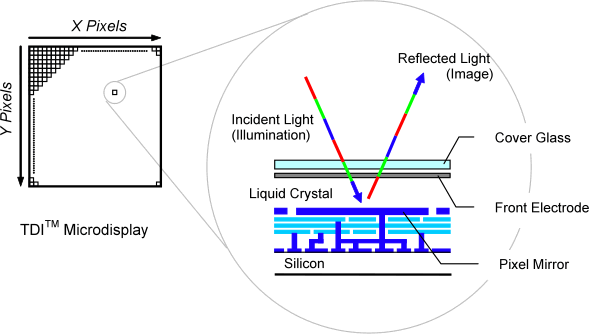 Forth Dimension Displays offers is a highly reflective Ferroelectric Liquid Crystal on Silicon (FLCoS) device. The very high switching speed of the ferroelectric liquid crystal (40 µs) enables rapid light modulation to create colour and grey scale with no spatial RGB beam separation and no sub-pixels. The FLCoS device comprises two substrates. The first is a pixelated CMOS substrate (backplane), which serves as both the active matrix to drive individual pixels and as a mirror. The second is a cover front glass substrate coated with a transparent electrode. Between the backplane and the cover front glass substrate is the ferroelectric liquid crystal material, which serves as the medium for light modulation in an electric field. The “in-plane” switching of the optic axis of the ferroelectric LC provides excellent viewing angles and enables simple optical architectures (see Amplitude Modulation). Selecting from the range of drive electronics the user is given the flexibility to choose a mode of operation to suit the application.